>For 4.0 or newer devices, system download manager will be used to download the pdf file. Otherwise for older devices, once pdf conversion is completed, system browser will be opened to download the pdf. The saved file may be different across different devices. Web2PDF: Web2PDF is the android way to convert web pages to pdf files. 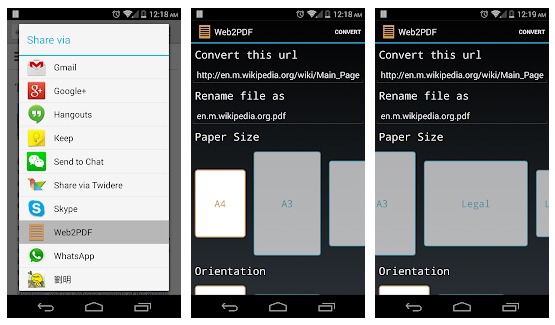 It lets you convert a web page to pdf file by using the unique "share" feature of android platform. Unfortunately website needs to be login is not supported.